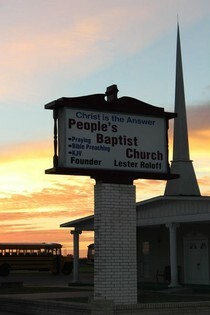 People’s Baptist Church is an independent Baptist church in Corpus Christi, Texas. The pastor is E.S. Mitchell. People’s Baptist Church in Corpus Christi, Texas believes that the King James Version of the Bible is the preserved word of God in the English language and offers traditional worship services in English. They have a service on Wednesday Evening. They offer the following ministries: Mens Home, Womens Home. Their Men’s Home is called “The Roloff Men’s Home” and the ladies home is called “The Jubilee Ladies Home”.